It's been an exciting month across the company at Barracuda. From new product launches and updates to charity rides and races. In case you missed it, we've highlighted a few below. We added some cool new capabilities for our Barracuda NG Firewall (NGF) customers with CudaLaunch. This new mobile app integrates with the NGF to extend the secure corporate network to end-users, regardless of their location. Get the details on the CudaLaunch product site here, in this press release, or in this blog post. We also have a Barracuda University video here. CudaLaunch is available for iOS and Android, and is available in German, Japanese, French, Spanish and Italian languages. We made big news when we launched CudaDrive, our secure, next-generation cloud file service. CudaDrive makes it easier for teams to share and access files from anywhere. You can find information on it at the CudaDrive web site, in this press release, and in this blog post. The Barracuda Load Balancer ADC family was enhanced with several upgrades. We've doubled the number of ports and offloaded SSL processing on select models. We have a press release here and a blog post here. You can see all of the details on the product website here. We've added new features to the Barracuda Email Security Gateway (BESG) with the release of version 7.1. The new Barracuda Exchange Antivirus Agent version 7.1 runs as a Windows service on Microsoft Exchange 2013 server and enables it to scan email for viruses. You can learn more about these new Exchange-based features on the product site here, or the T ech Library here. New application definitions (AppDefs) have been added to the Barracuda SSL VPN. The new AppDefs now include the latest versions of Windows, Mac OS X, iOS, Firefox, and more. You can get more details on the Barracuda SSL VPN in the Tech Library here. The Barracuda Email Security Service (BESS) was updated to version 2.8. There are several enhancements in this release, including a new layout and feature set available in the dashboard. Details are here. 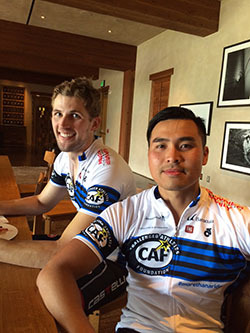 Barracuda sponsored and participated in the recent CAF NorCal event. 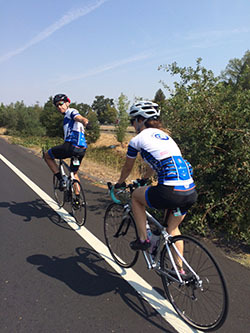 85 riders participated in the event, raising approximately $440,000 for the Challenged Athletes Foundation. Details are in this blog post. Our 8-person running team, the “Barracuda Blazers,” are competing in the Hood to Coast Relay (HTC)this weekend. This is an annual event to raise funds for cancer research. Follow our progress on twitter with #cuda2coast. You can follow the event news on twitter @HTCrelay and #htcrelay. Visit us at VMworld, booth #2011, August 30 – September 3. Details in this blog post. Stay tuned for a new product announcement in early September, that we're sure you're going to love!